In Nights at the Circus, Angela Carter presents us with the story of Sophie Fevvers, the ‘Cockney Venus’, the most famous aerialiste of her day, and what a dazzling, sprawling tale it is. The novel opens at the tail end of the nineteenth century, and the scene is Fevvers’ dressing room at the Alhambra Music Hall, London. Here, in a setting littered with her dirty underwear, Fevvers entertains American journalist, Jack Walser, with the tale of her biography to date. There is an aura of mystery surrounding the mercurial Fevvers – here we have a creature who claims to be part woman, part bird, and her slogan adds to the mystique: ‘Is she fact or is she fiction?’ Walser is all set to gain the inside track on the aerialiste’s story, and if at all possible, to get to the bottom of this mystery. Fevvers claims she was ‘hatched out of bloody great egg’ to the sound of Bow Bells, and the aerialiste paints a vivid picture of her backstory. We hear of Fevvers’ early years raised in a brothel, and how, aged thirteen, her wings burst through and she learns to fly. We follow the young Fevvers as poverty forces her to join Madame Schreck’s Museum of Women Monsters, where she is sold to the rather sinister Mr Rosencreutz. She pulled a coil of hair out of her chignon and wrapped it round her finger, twisting it and biting it thoughtfully; then, suddenly, she whirled away from the mirror on her revolving stool and leaned confidentially towards Walser. ‘My feathers, sir! I dye them! Don’t think I bore such gaudy colours from puberty! I commenced to dye my feathers at the start of my public career on the trapeze, in order to simulate more perfectly the tropic bird. In my white girlhood and earliest years, I kept my natural colour. Which is a kind of blonde, only a little darker than the hair on my head, more the colour of that on my private ahem parts. Towards the end of the novel’s London section, Fevvers joins Colonel Kearney’s circus, signing a six-figure deal to tour Russia and beyond. And Walser, who still senses something feral, almost dangerous about Fevvers (especially when he’s alone with this formidable creature) decides to go undercover and tag along as a clown. The tiger ran into the ring, hot on the scent of Sybil. It came out of the corridor like orange quicksilver, or a rarer liquid metal, a quickgold. It did not so much run as flow, a questing sluice of brown and yellow, a hot molten death. It prowled and growled around the remains of the chimps’ classroom, snuffing up its immense, flaring nostrils the delicious air of freedom fragrant with the scent of meat on the hoof. How yellow its teeth were; the festering teeth of carnivores. The Strong Man tore off the woman’s clinging arms, clutched his loincloth round his privates and made for the auditorium door. He was a fine specimen, in prime condition; he swung from tier to tier, past Walser struck like a pillar of salt, up and away. The exit banged to behind him. Walser heard the sound of the shooting of the bolts. Now the only way out of the ring was that by which the tiger had entered it. At the end of their stay in St Petersburg, an eventful final evening leaves the circus somewhat depleted as they depart for Japan – a journey that takes the troupe across Siberia by rail (forming part three of the story). I love the first two sections of this energetic and humorous novel. Carter blurs the margins between reality and the imaginary, and even though the story becomes increasingly surreal, I was fully engaged right up to the end of events in St Petersburg. But then, just as I was anticipating a grand finale, partway through the final section the story veers off course deep into the realms of fantasy. During the troupe’s travels across the Siberian hinterland, Carter really lets rip with her imagination, but for me, this is where the narrative gets lost in the wilderness. 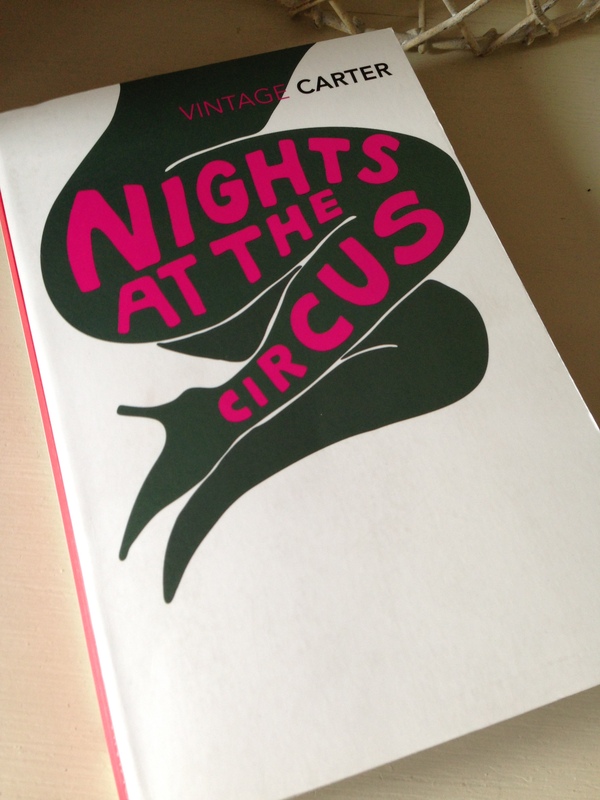 Reading Nights at the Circus is an intoxicating, heady and entertaining experience, and I’m sure it won’t be long before I return to Angela Carter. This entry was posted in Book Reviews, Carter Angela and tagged #ReadWomen, #ReadWomen2014, Angela Carter, Book Review, Fiction, UK, Vintage Books on August 11, 2014 by JacquiWine.